Following a diabetic diet may seem complicated at first, but as you learn how to select appropriate foods, preparing a meal gets easier. Understanding the composition of carbohydrates, proteins and fats allows you to choose the best foods for all your main entrée diabetic recipes. Moreover, you may be surprised with how many delicious recipes you can prepare. Chicken and dumplings is one of the great comfort foods. This popular comfort food can be used as a diabetic soup recipe, appetizer or main entrée. Make sure to add vegetables to the recipe to add more nutrition and bulk to your meal. Remove skin from chicken pieces. Place chicken pieces in a large saucepan. Add water, celery, onion and salt. Simmer, covered, 1 hour or until meat is tender. While simmering, prepare dumplings by combining flour, baking powder and salt in a bowl. Cut in shortening. Add milk until dough is stiff. Prepare a lightly floured surface and roll dough out to about 1/8-inch thickness. Cut dough into 1-inch strips or squares. Remove chicken from bone and return chicken to chicken stock. Bring chicken and stock to a boil; add rolled dumplings. Cover and boil gently 8 to 10 minutes. Serve immediately. Diabetic exchanges per ¾ cup serving: 2 Medium Fat Meat, 1 Starch. For a great new twist on an old favorite, try stuffing your hamburger with one of the fillings listed below. This recipe is great if you're looking for a starch-free meal. However, most people do like to use a hamburger bun. A great low-carb way to enjoy the bun is to buy "light" hamburger rolls. Regular buns are worth two starch exchanges, but the light buns are worth only one, and they also contain more fiber. In a bowl, mix the ground sirloin with the water, pepper and salt; form into 12 small patties. Place 1 tablespoon of desired filling in the center of each of six patties. Place a second patty on top of each patty with filling and seal the edges to secure the filling inside. Grill, bake or fry with nonstick cooking spray until patties are lightly browned. 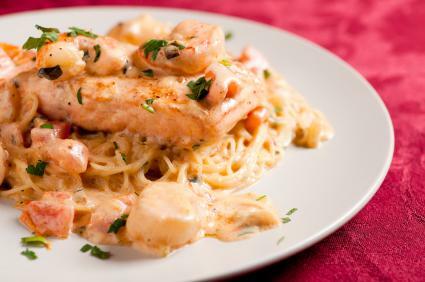 Many diabetics shy away from pasta because of the high carbohydrate content, but there is no reason pasta can't be enjoyed as part of a balanced diet. This recipe includes scallops, but any lean meat or seafood can be used. Add the garlic and sauté for 30 seconds. Add the tomato and sauté for 2 minutes. Add the evaporated milk and stir constantly over medium heat until thickened. Add the marjoram and pepper. Add the scallops and cook for 2 minutes until the scallops turn opaque. Pour the scallops with sauce over the angel hair pasta and serve immediately. Adapted from: Diabetic Meals in 30 Minutes or Less by the American Diabetes Association. Preparing diabetic recipes requires an understanding of the Diabetic Exchange System and the recommended guidelines, but there are also other factors to consider when preparing meals. Make a habit of choosing unrefined, whole grain carbohydrates over refined grains, pasta, flour and cereals, wherever possible. 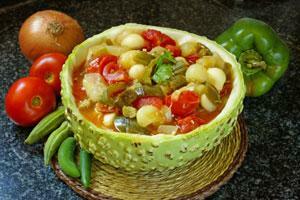 Soluble fiber regulates blood sugar; thus, foods high in fiber, such as beans and legumes, are excellent food choices. Eating moderate amounts of low-fat protein is also part of the diabetic diet. Lastly, following a daily meal schedule will help to regulate your blood sugar levels throughout the day.